The following article appears in the December 2014 edition of the The Historical Bulletin of the Brown County Historical Society, and is one in a series of articles on Brown County's historical markers placed in the early 1900s. At the intersection of South Adams and South Washington Streets there is created by the unusual convergence of the two streets a small plot of land upon which have been placed three markers. One, the wording carved into the face of a split boulder, identifies the location of “La Baye burial place 1720 – 1835”. 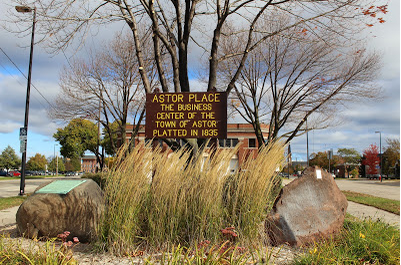 Another, a wooden sign entitled “Astor Place”, describes the location as “the business center of the Town of Astor” and “Platted in 1835”. Upon a large granite boulder is mounted the third marker -- a simple bronze tablet unveiled November 9, 1924, recording the locations of the first Catholic church and the first Catholic cemetery in Green Bay. The marker’s placement was the result of much research by Green Bay Historical Society president Arthur C. Neville. In the February 15, 1925 edition of the Green Bay Historical Bulletin, Mr. Neville recounts his research efforts, the marker’s unveiling, and a history of the church and cemetery. On this 90th anniversary of this bronze beauty’s dedication, it was decided to reprint Mr. Neville’s article with the following caveats: some content was removed to meet this publication’s space limitations; and, punctuation, capitalization, and spelling was left as published in 1925. For some time past, as a member of the Green Bay Historical Society I have been engaged in an examination of old records and documents, and the recollections of the very early settlers of The Bay, with the design of ascertaining, as near as possible, the site of the first church built in Green bay, and of the old cemetery adjoining for the purpose of marking their sites with suitable tablets. This purpose has now been accomplished, for on November 9, 1924, a fine bronze tablet affixed to a large granite boulder was unveiled with appropriate ceremonies by the Marquette Club of Green Bay, marking this first church site. Early in the summer of 1823 Father Gabriel Richard, Vicar Apostolic of the Northwest, visited Green Bay. He solemnized a few marriages, and baptised a number of children and some adults. The population of Green Bay at this time was about 300, their log cabins strung along the shore on each side of the river as far up as the De Pere rapids. He arranged for the building of a church, which was commenced the same year under the supervision of Father Stephen Badin, who was sent here for that purpose, and so far completed before winter set in that services were held in the building. At the time the church was built the whole region surrounding it was a forest in all its native wildness, except for the de Langlade farm, a narrow clearing extending about as far back as Madison street, and the old cemetery with its whitewashed picket fence to the north. The chapel stood alone near the edge of the woods. The Private Claims, which had been confirmed to the old settlers or squatters in 1922 had not yet been surveyed. The plat of Astor was not surveyed or laid out until twelve years later. There were no streets or blocks or nearby landmarks by which to fix its relative position. The only houses in the vicinity were those of the de Langlades, at the foot of Stuart, and the Pierre Grignons, at the foot of Crooks street, both very near the river shore. Surveyor Ellis gives a graphic description of “The Bay” in 1822: There were some half dozen houses along the river north of Lawe’s point occupied by the Grignon family, and a new one just finished which afterwards (1824) fell into Judge Arndt’s hands; and an old one much dilapidated just at the mouth of the little slough, only a part of which was still standing. Pierre Grignon, Jr., was living in a house a few rods south Arndt’s old place. Just above this house of Pierre Grignon, Jr., was the cemetery, picketed in and under the control of the Catholics. This old cemetery was used as a burial place by the French and English traders and habitants of La Baye for more than a century. Most of the noted men of Green Bay who died between 1720 and 1835 were buried here. Interments continued to be made until the plat of Astor was laid out in 1835. From time to time thereafter, as the surrounding property was occupied and built upon, numbers of bodies were removed to the new Catholic cemetery at Allouez. Others were removed to the Protestant cemetery, now Baird’s park. In making excavations for water mains on Adams street in 1886-7 a number of bodies were disinterred between Crooks and Chicago streets. These were rebuired in the street, but beyond probable future disturbance. Many bodies still lie under the pavement and the abutting lawns and gardens.